Crimson Trace LG-619 G-Series Laser Grips for Glock 19 23 25 32 38 FREE SHIPPING! The Crimson Trace G-Series of Laser Grips are designed specifically for Glock pistols, with a downsized polymer frame that reduces weight and leaves the original grips exposed. This model fits the Glock 19, 23, 25, 32 and 38 handguns. The rear switch employs Crimson Trace's innovative Instinctive Activation technology, activating automatically when the weapon is held in a shooting grip for effortless accuracy. 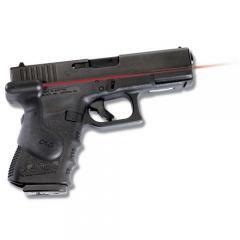 The .5-inch red laser dot has a peak output of 5-milliWatts, the maximum allowed under federal law, for impressive visibility in all lighting. It is factory-sighted at 50-feet. Windage and elevation settings are user-adjustable in order to suit aiming needs. ©2002-2019 CopsPlus.com: Crimson Trace LG-619 G-Series Laser Grips for Glock 19 23 25 32 38 FREE SHIPPING!